Airports Authority of India Recruitment Examination 2018: Airports Authority of India (AAI), Human Resource Management has been invited applications from the citizens of Indian Personals for the recruitment of 37 available vacancies of Junior Executive HR, Manager HR. Eligibility criteria having candidates may apply online on or before 16-08-2018. This Junior Executive HR recruitment only for the candidates who are domicile of Indian states. Selection for Junior Executive HR of AAI Recruitment will be held based on written test and personal interview. Other details regarding this recruitment of AAI Junior Executive HR 2018 please see the details furnished below. 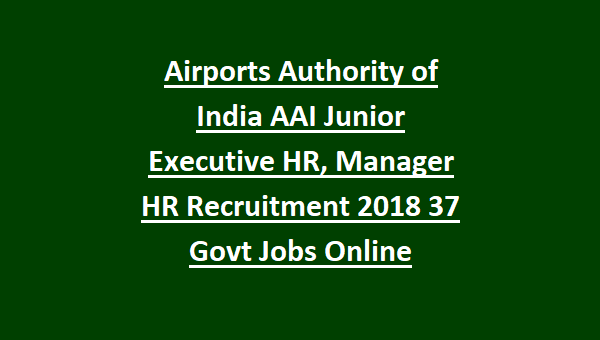 Click here to see the official notification of Airport Authority of India Junior Executive HR Recruitment 2018. Last date to reach the applications to AAI is 16-08-2018. There are total 37 vacancies available in this current recruitment of AAI. For Junior Executive HR As on 30-06-2018 the candidate's maximum age limit is 27 years for General, 35 years for SC/ ST and 33 years for OBC candidates. For Manager HR Jobs Upper age limit is 32 years. Exam pattern and syllabus will be given in the official website of AAI. Note: Only shortlisted candidates will receive call letter or admit card to attend the written exam. Eligible criteria having Male OBC/General candidates have to pay Rs.1000/-. No application fee for SC/ST and women candidates. The eligible candidates can submit the application form online through official website of AAI @ “www.aai.aero”. Last date to apply online is 16-08-2018. Written Exam syllabus, admit card released date and results are given in this website only. 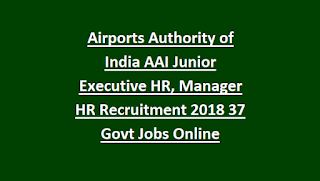 Click here to download the official notification of AAI Junior Executive HR Recruitment 2018. Please share this recruitment notification of Airport Authority of India Manager HR with your beloved friends via the social media such as whatsapp, facebook, googleplus and twitter.